Smoking a whole chicken using this recipe can be a long but satisfying process with a delicious end result. Smoking the chicken long and slow at a temperature of 225 degrees Fahrenheit allows the meat to cook slowly and absorb the smoky flavor of the wood chips. Depending on the size of the whole chicken you are going to smoke, the cooking time may take anywhere from 2 to 5 hours to smoke the whole chicken until it is fully cooked throughout. The only problem with smoking a chicken for this long period of time is the tendency for the meat to dry out. There are many things you can do to avoid the meat from drying out like injecting or brining the chicken prior to putting it on your smoker. The best way to tell if the chicken is done is to stick an instant-read meat thermometer in the deepest part of the chicken breast. If the smoked chicken breast reads 160-165 degrees Fahrenheit, it is safe to pull it off your smoker to let it rest. Below will provide you with steps and information for how to smoke the chicken, avoid it from drying out, recipe ingredients, cooking time and other smoking tips. You really can’t go wrong when it comes to seasoning the chicken before you put it on the smoker. You can season it as light or as heavy as your taste buds can handle, but we recommend fully coating the bird to provide the maximum flavor in every bite. You can either go buy a chicken dry rub or barbecue rub from your local grocery store or use a variety of dry seasonings you already have in your kitchen. For those of you who like to follow a specific recipe, below is a great set of ingredients that are sure to make a great smoked chicken. First, start by soaking your wood chips in water an hour to two before you want to put your chicken on the smoker. Soaking these wood chips will allow them to smolder and smoke for a long period of time instead of lighting on fire and quickly burning up. Do not soak your wood chips for more than a couple hours. Light your charcoal smoker approximately 30 to 35 minutes in advance of putting your chicken on. You will know that your charcoal is ready when all of the coals turn from black to a glowing white ash color. During the half hour while you are waiting for the charcoal to fully light, mix all of the chicken rub ingredients together in a mixing bowl. Fully coat the outside skin and the inside cavity of the chicken with your seasoning rub mixture. Next, separate the skin on top of the chicken breast from the meat by using your hands to pull them apart from one another. This will allow you to also put the rub ingredients under the skin so the seasonings can deeply penetrate the meat and maximize the flavor of the chicken. Fill your meat injector with the chicken broth and inject the bird in the breast meat, legs, and wings. This is an essential and final step in preparing your whole chicken for the smoker so that it won't dry out. Wrap your wood chips in an aluminum foil pouch and punch holes in the top with a fork in order to allow the smoke to escape the pouch. Toss the pouch on top of the charcoal right before you put your chicken on the smoker. Each pouch will last approximately 2 hours of smoking time, so depending on the heat and the size of the chicken you are smoking, you may need to repeat this process a couple times before you are done cooking. You can also place foil drip pans under the chicken while it is cooking in order to catch the drippings to make great tasting gravy. Put your chicken on the smoker and adjust the vent on top of your grill to about 3 quarters of the way open. If your grill lid is adjustable, make sure the vents are positioned over the top of the chicken in order to draw all of the smoke over the bird before it escapes out the top of the grill. Check the chicken about every hour to make sure you have the ideal temperature and smoke. Do not check your chicken any more than every hour or you will let all of the smoke and heat out of your smoker. This can lead to increasing the cooking time and risk drying out the bird. 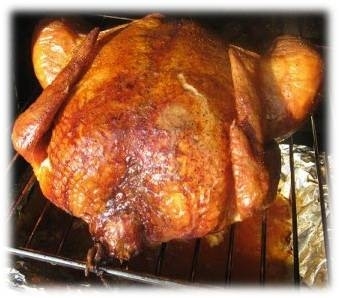 You can also baste the bird with butter (optional) throughout the cooking process to ensure a juicy, crisp end result. If you are using a side smoker box grill, you will need to turn your chicken half way through the cooking process to ensure both sides are cooked evenly. See below for more information about cooking times and how to determine when your chicken is done. Knowing how long to smoke a chicken is half the battle. The cooking time will take anywhere from 2 to 5 hours to smoke a whole chicken. An average size chicken's cooking time on a smoker will take about 4 hours but can vary due to a number of variables. This will depend on the weight, the temperature and the type of smoker you are using, and how many times you open the lid during the cooking process. The easiest way to check to see if the chicken is done is to stick an instant-read meat thermometer in the deepest part of the chicken breast and see if it has reached a temperature of 165 degrees Fahrenheit. See our meat doneness chart for a full list of different meat doneness internal temperatures.